Overall, I traveled a little less in 2017 compared to 2016. My biking was down (I no longer commute downtown every day), but train travel was up, since I now live next to a MAX stop. I biked a total of 1,149 miles in 2017, down from 1,529 in 2016. I flew 44,796 miles in 2017, down from 55,271 in 2016. 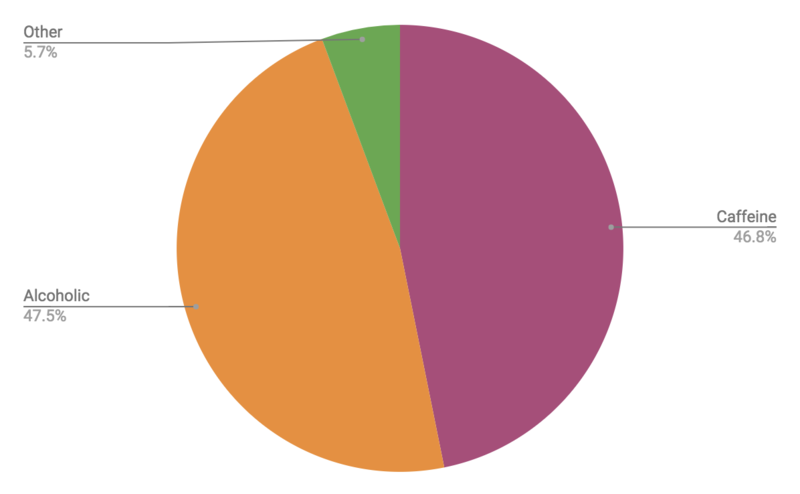 I spent only a little more time in cars this year, my least-used mode of transport other than walking. Car trips include me driving a car2go (very rarely), getting a ride in someone else's car, as well as taxis and Lyft rides. Sadly my bike mileage was just shy of 2x my car mileage, so perhaps I should make it my 2018 goal to double my car mileage on bikes. While my plane trips dominate in mileage, the time spent in each mode tells a very different story. I spent more time on my bicycle than any other mode of transport! 126 hours on bikes, and the next highest mode is 101 hours on planes. My beverage consumption was split almost 50/50 between alcoholic and caffeinated beverages, with very little of anything else. (I don't track my plain water consumption because I drink way too much water to track it easily.) Out of 1,794 beverages consumed, only 5.7% were non-caffeinated and non-alcoholic. 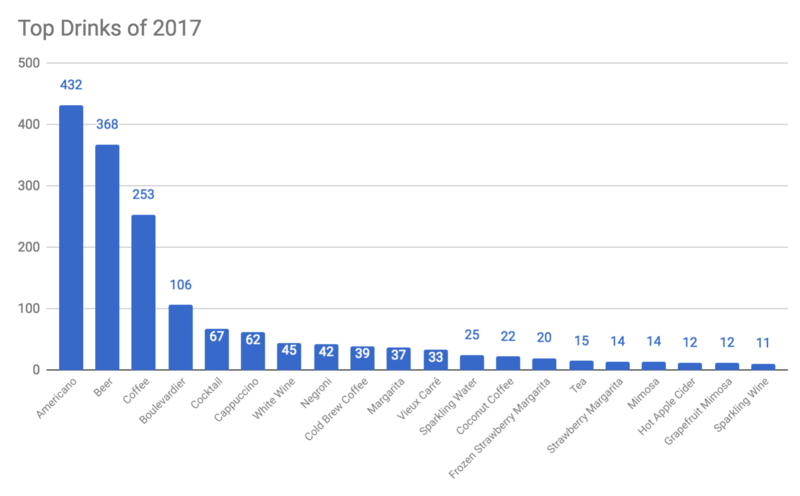 My top drinks of 2017 were: Americano (coffee), Beer, Coffee, and the Boulevardier cocktail. 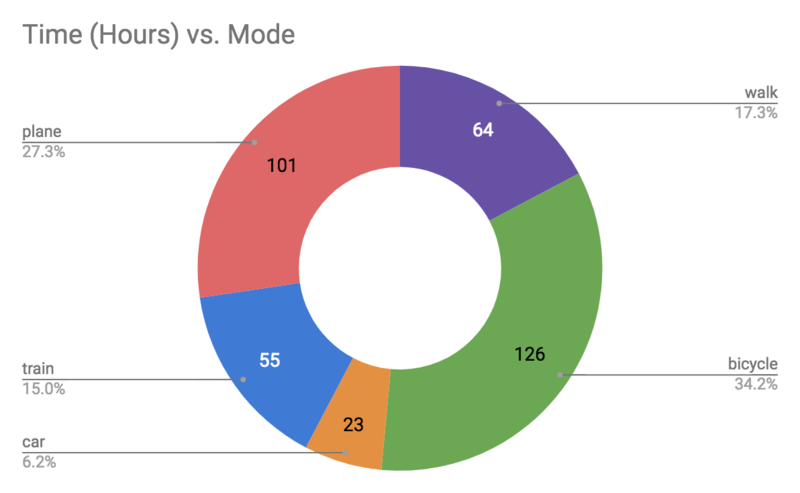 Overall, I tracked 16 different types of coffee, and 24 named cocktails. I lump specialty cocktails together and track them just as "Cocktail" otherwise it would take too long to enter all the data. My cocktail of choice this year was apparently the Boulevardier, followed by the Negroni. I will also note that the Vieux Carré is way up there, which is notable because that is one that I don't make at home, I only have it at Imperial in Downtown Portland. It's $5 during happy hour so it's hard to pass up! All this data is collected by my own tools and stored in my website. You can see the individual entries for each bike ride, walk, and other transport, as well as everything I eat and drink. For tracking food, I use a web app, Teacup, which I bookmark to my phone's home screen. 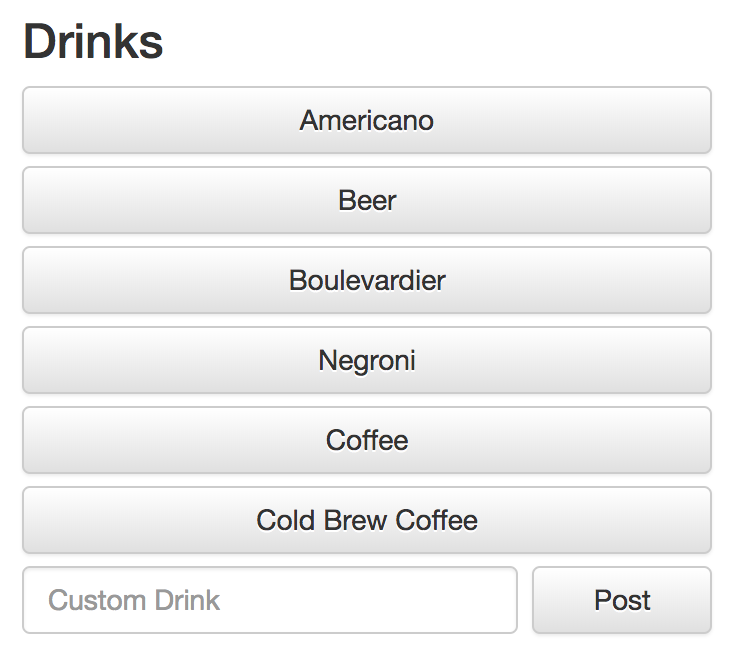 The interface prompts me with the most often used food and drink, and I can also type in new values if I need to. 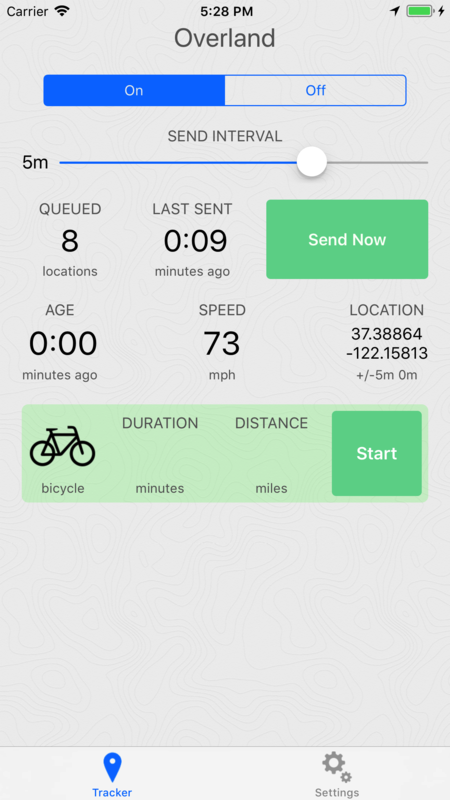 For my trip tracking, I use my GPS tracking app, Overland, which I recently published to the iOS App Store! It's a pretty barebones app, but it works well. It tracks my location all the time, which is used to geotag all my posts, as well as provide the weather information for the posts. It also lets me choose a mode of transport and start tracking a trip. Overland first sends the data to my Compass database, which then sends trips to my server which adds a map image and stores it on disk. Later I can query the server to find all the trip and the time/distance for each.